AquaMaxx WS-1 In-Sump Protein Skimmer. The highly-rated HOB-1 skimmer is now available in an in-sump version! The AquaMaxx WS-1 protein skimmer features an incredibly responsive collection cup and an amazingly powerful submersible pump. It is rated up to 65 gallons in a design thin and light enough to be placed on a nano aquarium, all-in-one style aquarium or other small saltwater aquarium. The AquaMaxx WS-1 protein skimmer removes organic waste from aquarium water. It creates a strong mix of small air bubbles and turbulent water movement to force protein, waste and other materials into a collection cup for easy removal. The new Conical diffusers help to reduce turbulence in the reaction chamber and achieve more-stable, laminar flow to maximize performance. AquaMaxx skimmers are computer-precision engineered and utilize the latest filtration technology to deliver the performance and value you are looking for in a protein skimmer. EASE OF USE AquaMaxx WS-1 protein skimmers are easy to setup and maintain. Just move the collection cup up or down to adjust the foam level to wet or dry. A removable collection cup makes cleaning easy. Plus, every AquaMaxx protein skimmer includes a drain fitting for hobbyists who want to setup a separate reservoir for skimmate. Water quality and consistency is crucial to the success of a marine aquarium. An AquaMaxx WS-1 protein skimmer will help to ensure that success. 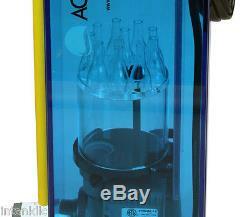 COMPACT DESIGN AquaMaxx protein skimmers were designed from the ground up with the hobbyist in mind. The AquaMaxx WS-1 protein skimmer have the pump placed inside the skimmer itself to save space, reduce noise and improve efficiency. All AquaMaxx protein skimmers are computer designed. Each unit is precision-cut and made of polished cell-cast acrylic. PERFORMANCE The AquaMaxx WS-1 protein skimmer relies on a superbly crafted Italian Sicce Syncra pump and AquaMaxx needlewheel impeller to vigorously remove waste from your fish or reef tank. Sicce pumps are well-regarded for their efficiency to move air and water. Combining these dynamic pumps with AquaMaxx protein skimmers saves users considerable energy. Footprint : L 5.9" x W 3.2". Height: 14 (excluding collection up). Collection Cup Height: 5.5. Recommended Water Level: 8"-10". Pump(included): Shark 1.0. Pump power consumption: 11 Watts. Requires approximately 5.5 of clearance to remove collection cup. Collection cup drain may vary slightly from pictures. The item "AquaMaxx WS-1 In-Sump Protein Skimmer UJ00189" is in sale since Monday, November 16, 2015. This item is in the category "Pet Supplies\Fish & Aquariums\Filters". The seller is "intankllc" and is located in Menomonee Falls, Wisconsin.